What sort of feelings does the color red conjure up? Passion, fire and spiciness are just a few. When you add red terry towels to your bathroom, you instantly liven up the space. The boldness of the red gives the room a focal point. When you walk in, your eyes are drawn immediately to the bold color of the towel. Why settle for the ordinary? Embrace the extraordinary every day with red terry velour hand towels that aren't just eye-catching, but are high-performance, too. Order as many units of wholesale terry velour towels as you need for your residential or commercial use today. 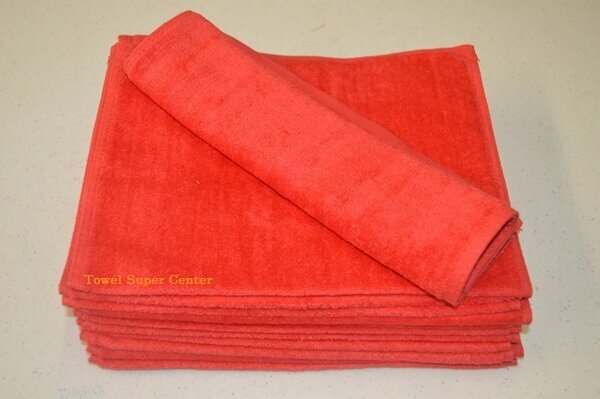 Remember, Towel Super Center offers terry hand towels in other brilliant and muted colors, too! Hand towels aren’t just for decoration, of course. They’re also practical. When you wash your hands, you want a reliable towel to dry them on. There’s nothing worse than trying to use a subpar towel to get the excess water from your hands. Clean your terry hand towels soon after use. If you can't immediately launder them, hang them to dry, so they release the moisture they've absorbed. Use a detergent that's tough on grime but easy on 100-percent cotton fibers. Look for soaps with as few ingredients as possible, as they tend to help your towels last longer. Skip the liquid laundry softener — it may add a layer of moisture-fighting residue to your towels, making it harder for them to absorb liquids. Add a dryer sheet to your drying cycle for added fluffiness without all the fuss! Have a few members of your household with sensitive skin? Know that some of your business patrons require ultra-fluffy towels? Be sure to avoid using any laundry or pre-treatment products with fragrances, dyes or chemicals. Follow these tips to ensure you always have a fresh, beautiful, tough-yet-plush wholesale terry velour towel on-hand the ready! Absorbent and soft hand towels make your bathroom comfortable for you and guests. Investing in fluffy, inviting towels can help you seem more hospitable and give your guests a more comfortable stay. We have a return policy to ensure you’re 100 percent satisfied. We offer wholesale discounts if you want to buy your towels in bulk. We sell towels that look as great as they feel. Add a dose of cheeriness to your day with our red terry velour hand towels. At Towel Super Store, we want you to be pleased with your purchase. That’s why we have a return policy that allows you to get your money back if you’re not satisfied with it.